팔로우하시고 업데이트, 커뮤니티 뉴스, 이벤트, 대회에 대한 정보를 확인하세요! Tearaway™ & Tearaway™ Unfolded ©2013-2016 Sony Interactive Entertainment LLC. Published by Sony Interactive Entertainment LLC. Developed by Media Molecule. 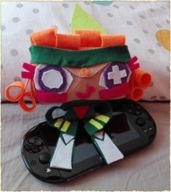 “Tearaway” is a trademark or a registered trademark of Sony Interactive Entertainment LLC. All rights reserved.